3 Titles in 1 Box! Jimeoin On Ice, Jimeoin Something…Smell Funny & Jimeoin What? Join Jimeoin for a night of boot scootin, thigh slappin, tootin and a hootin laughs this side of funnysville. ‘It gets no better than this... Hilarious!’ (Time Out). His ever-evolving live show and the most famous eyebrows in comedy. ‘If laughter is the best medicine, Jimeoin is a course of steroids... Brilliant wit and razor-sharp take on the absurdities of life… Series of hilarious, often surrealistic climaxes. This is the comedy of one who truly perceives human behaviour, breaks it up, puts it all together again in all its ridiculousness, to leave you with your eyes streaming’ (Evening News). ‘Stand-up comedy at its best!’(Scotsman). 4 Titles in 1 Box! Jimeoin's Box Set is a smorgasbord of Jimeoin. 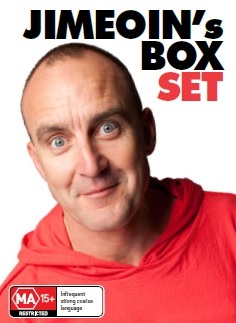 Featuring four classic releases in one big box seat his brilliant best in his two stand-up DVD's 'On Ice' and 'All Over the Shop'. Join Jimeoin as he travels across the top end of Australia in his hilarious eight part TV series 'Over The Top' or sit down to a comedy feast with the very appetising 'Jimeoin and Bob's Cooking Show' If you love Jimeoin and lots of him, this is the box set for you! Internationally hailed as one of live comedy’s masters, Jimeoin brings his hilarious new show into your lounge rooms in this stunning presentation of world-class stand-up. On a warm night n June in the year of our Lord 2001, Jimeoin stepped on stage at The Gaiety Theatre in Bublin. He shouldn’t have been there. They were expecting the Bay City Rollers, but no one seemed to notice. It rocked! I felt like I haven’t written enough on the back for people to read... so what else. Oh, a quick gag. This guy goes to the doctor, and says I’ve got a strawberry stuck up my bum. And the doctor says, oh I’ve got some cream for that... There you go, come and see me live. An 8-part series which follows the star’s antics on the road and on stage while touring across the northern-most parts of Australia, his adoptive home. This funny warts-and-all series is part travelogue, part fishing trip and part stand-up show which sees Jimeoin travel all over Australia - from Broome via Darwin to Byron Bay and beyond! Included in this series is footage of his performances at the iconic Sydney Opera House, world famous Spiegeltent, and the highly popular Jimeoin’s Cooking Show filmed in Adelaide. After a hugely successful run in 2008 on BBC Northern Ireland with Jimeoin Down Under, this series featured on The Comedy Channel in May and June and replays in December 2010. Jimeoin not only delivers some brilliant stand-up, but also takes us on the most extraordinary fun road trip across Australia. From the magical world of Jimeoin comes this smash hit show Jimeoin on Ice. See Jimeoin gracefully skate through brilliantly funny observations on the absurdities of everyday life… so don’t just stand there reading the back, get your skates on and head home to watch this Comic Masterpiece. "As sharp as they come... Stand up is rarely so appealing" London Evening Standard "...has his victims doubled up in agonising laughter" The Herald. Jimeoin: Over The Top is an 8-part series which follows the star’s antics on the road and on stage while touring across the northern-most parts of Australia, his adoptive home. This funny warts-and-all series is part travelogue, part fishing trip and part stand-up show which sees Jimeoin travel all over Australia - from Broome via Darwin to Byron Bay and beyond! Included in this series is footage of his performances at the iconic Sydney Opera House, world famous Spiegeltent, and the highly popular Jimeoin’s Cooking Show filmed in Adelaide. After a hugely successful run in 2008 on BBC Northern Ireland with Jimeoin Down Under, this series featured on The Comedy Channel in May and June and replays in December 2010. Jimeoin not only delivers some brilliant stand-up, but also takes us on the most extraordinary fun road trip across Australia.